On Sale Now: An Unofficial Black Friday Bargain Hunt! 135 West 70th Street Penthouse BC; Listing photo Douglas Elliman. Late November can be an anxious time for both buyers and sellers; unpleasant weather, family events and just plain seasonal shutdown mode can reduce the traffic at open houses to a trickle and get properties pulled off the market until after New Year’s Day or even springtime. Sellers may panic and prices get cut in the hopes of getting the deal done before year’s end; it’s a good time for intrepid buyers to stay in the game, though, because the competition factor is at a minimum. 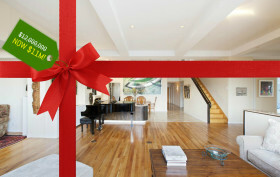 After reading about Leo DiCaprio who, like Macy’s, Wal-Mart and Kohl’s, jumped the gun on the traditional discount day by price-chopping his haute-holistic Delos Living penthouse, we rounded up some stellar dwellings that received significant markdowns just in time for the popular post-Thanksgiving Day shop-a-thon. So if you’re on the hunt–or you’ve got a two-bed-two-bath-with-killer-views-sized stocking to fill–check out our list of sale merch of the real estate persuasion that–we hope–won’t require you to queue up at the crack of dawn.